If you decide that you want to make a necklace using stones that you collect while on vacation, please make sure that you do not remove specimens from any protected lands like National or State Parks. There are plenty of places that you can legally collect stones, shells, and other natural materials. I fell in love with lava during our visit to Volcanoes National Park, but I collected it on private lands after asking if it would be ok.
A few people asked me if I wasn't worried about the "bad luck" that is reported to follow people who remove lava from Hawai'i. Nope. I'm not. Lava is sold on the mainland through catalogs, bead shops, and home depot, and in just about every convenience store on the Hawai'ian islands. I bought some lava beads while I was there, and asked the bead shop owner about the legend. She said that she was pretty convinced that it was not as much a traditional tale as it was a story made up by tour guides who were sick of having to clean up after tourists who brought it on board the tour buses. Anyway, if you worry about these types of things, don't use lava (or faerie stones, or opals, or...). Use river stones or something like that instead. Please download a copy of Chapter One (it's free!) 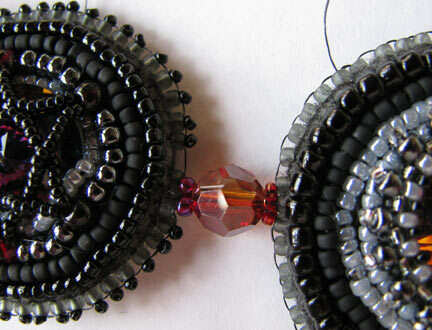 of my e-book, Every Bead Has a Story, where you will find the step-by-step instructions for the major stitches and other bead embroidery techniques. I'll be showing pictures here, but not giving detailed instructions. 1. 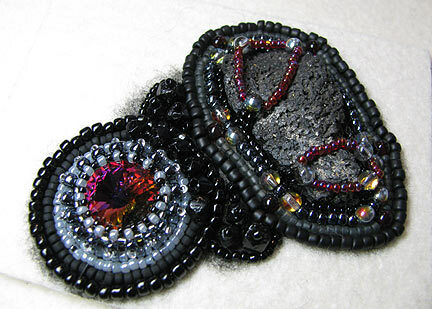 Bezel your stones and other focals (I used Swarovski rivolis), and back stitch around them to create a number of bead embroidered elements. 2. Use edging brick stitch to attach a backing to each piece. 3. 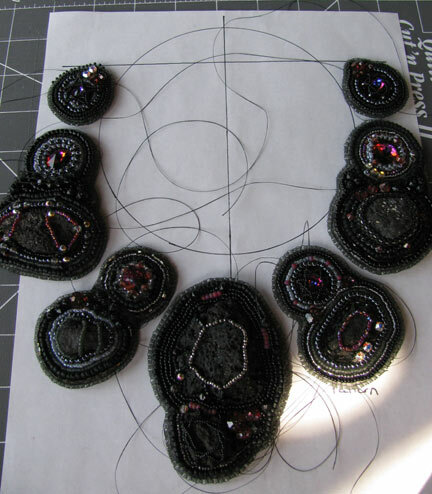 Play with your bead embroidered elements until you have them arranged the way you want. 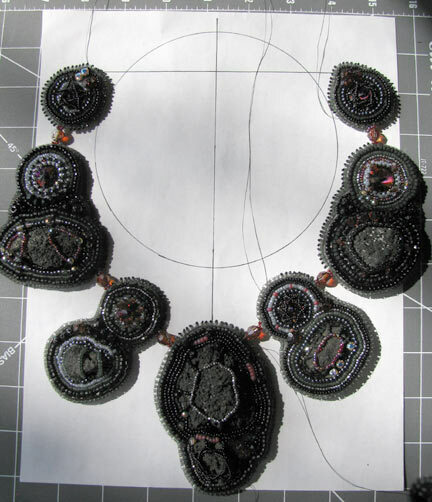 Use a paper necklace pattern to see how each piece will be oriented. 4. 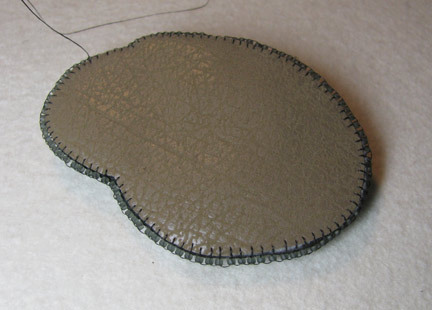 Use brightly colored thread to mark the spots where you will stitch the pieces together. 5. 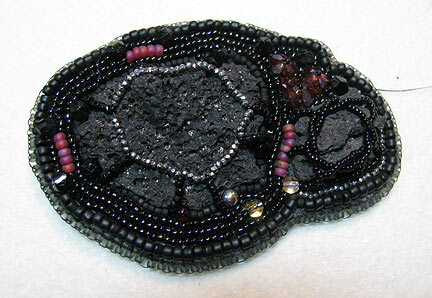 I chose to use Swarovski crystals and seed beads to stitch the pieces to each other. I really LOVE that !!! I wish I could make something like that !!! The tip about using bright thread to highlight where you want to join the pieces is GENIUS! 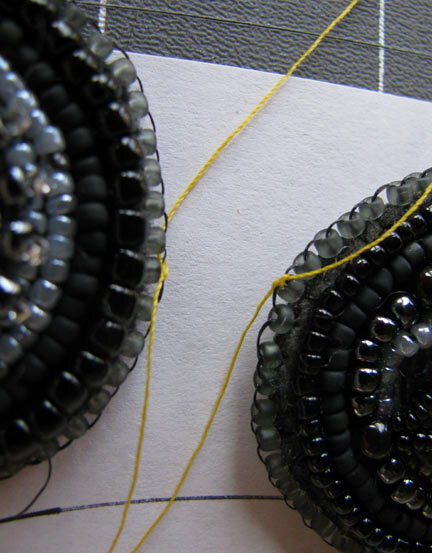 You can't imagine how many times I've tried to get the seed beads on the needle without taking my eye off the perfect place to make that join...You have just saved me tons of time and frustration! Wow! What a beautiful necklace. I've always loved lava and have thought it would be beautiful with pearls. Clever idea, marking the places where you're going to attach with colored thread. This is going to help me so, so much in an upcoming project, so thanks! Great idea. Now i need to figure out the paper necklace to try my hand at this. How big of a circle do you recommend? Mine is about 5 1/2 inches in diameter.